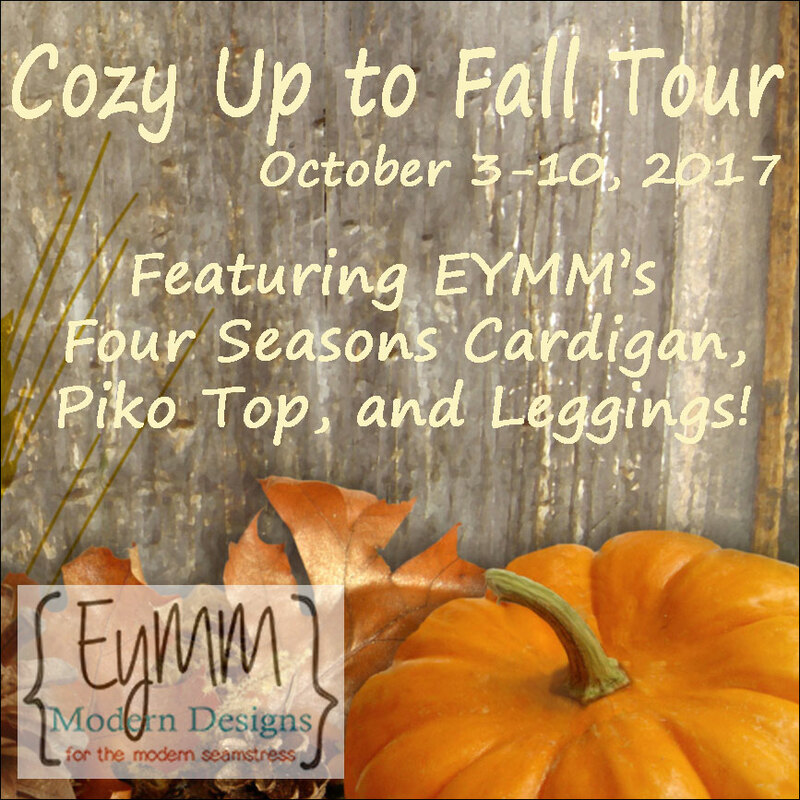 My Turn to Cozy Up to Fall – Everything Your Mama Made & More! Today it’s my turn to Cozy Up to Fall! When Kymy and I started planning this tour, I thought it’d be the perfect timing to give the Piko Top another try. I made one a couple years ago, but wasn’t in love with it and I think it ended up in my sister’s closet. 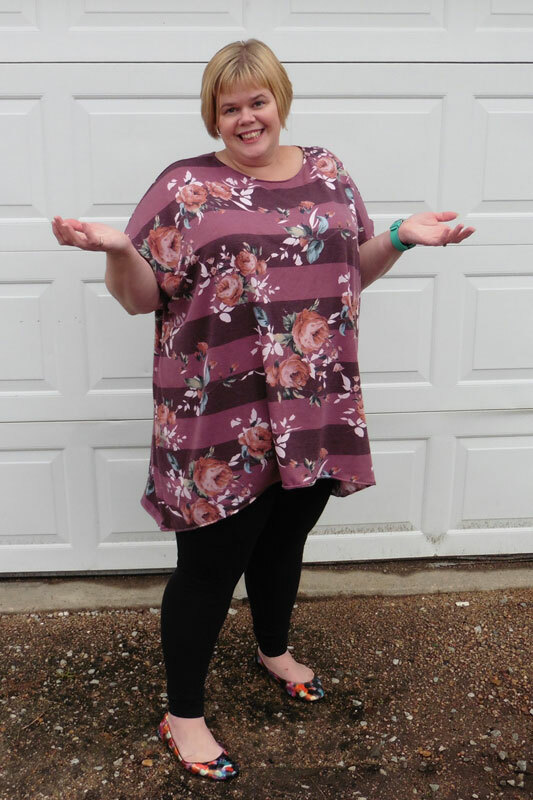 That was before I discovered the wonderfulness of wearing leggings and I’d been thinking the loose fit of the Piko would be the perfect match for my latest black ‘Get Moving’ Leggings (I’ve thoroughly professed my love of leggings in the past, so I’m going to focus on the Piko today … but don’t miss out on the sale listed at the end of my post!). I perused my fabric stash and chose this cozy poly/spandex blend French terry that I got from So Sew English Fabrics. 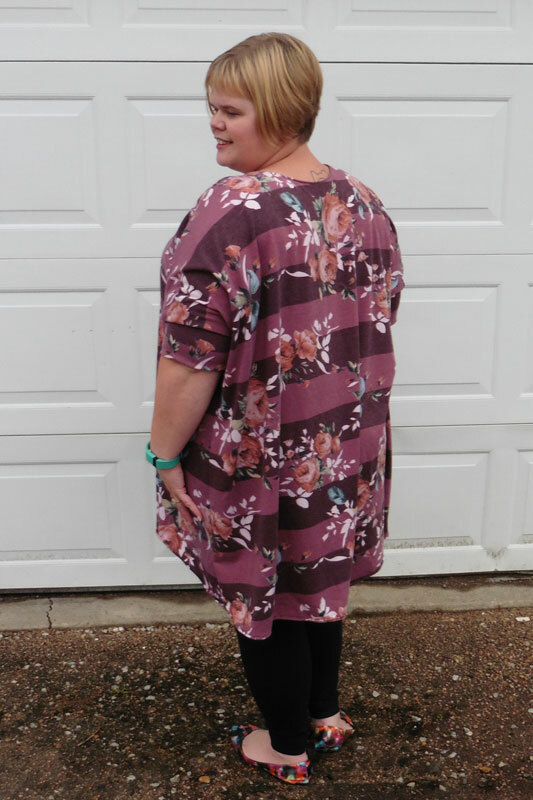 I thought the heathered tone-on-tone mauve stripes were perfect for autumn and that it would drape beautifully. Turns out, I was right! 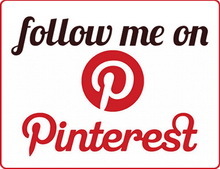 The only real modification I made to the Piko Top pattern was to add length … 5.5 inches, to be precise. 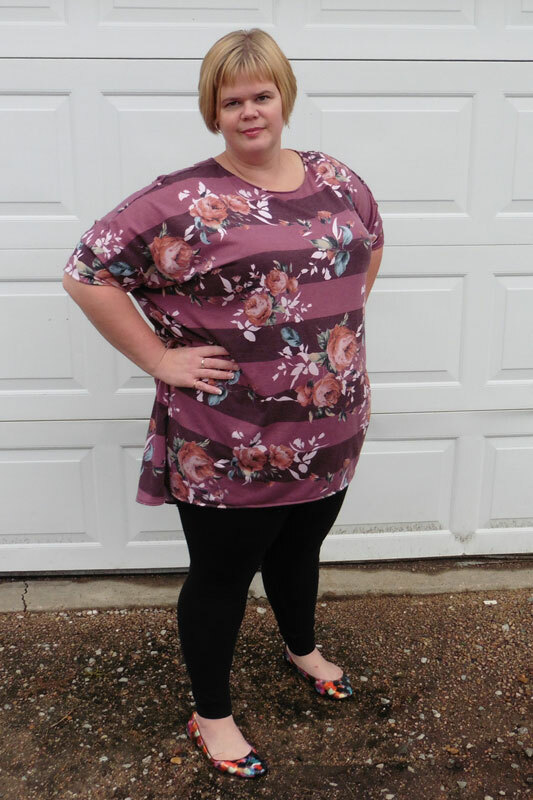 I wanted the top of the front hem curve to hide my hanging extra belly skin (thanks to 5 c-section babies) and have lately been loving the length of an over-sized-t-shirt-turned-Boxy-Boyfriend that I made in August. 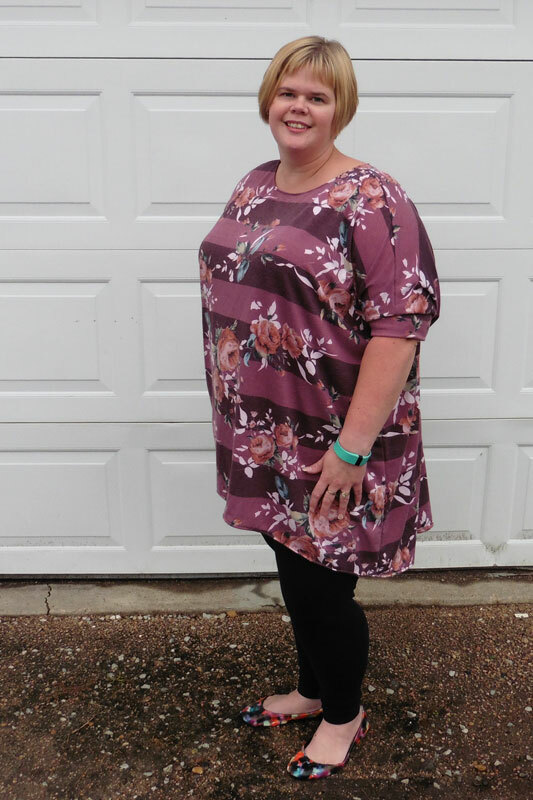 I measured that shirt from shoulder to front hem and found that it was roughly 5 inches longer than the Piko pattern front measured at the top of the hem curve. I threw in an extra half inch just for good measure (and to compensate slightly for differences in fabric drape since it’s easy to cut shorter, but I wouldn’t be able to add extra after the fact). Since the Piko side seams are fairly straight, I simply cut the pattern piece at the length adjustment line and added it all in that one spot. If I were working with a more fitted pattern, I would’ve added portions of the extra length in several places through the pattern in order to keep the proportions fitting correctly. Now, other than adding length, I wanted to follow the pattern exactly. I blended out to the next size up for the waist and hip so that my top would fit as originally intended (even though there’s plenty of ease and it technically would’ve fit without blending sizes). I also widened the armhole and used a bigger sleeve because my upper arm girth is two sizes bigger than my bust size. I really intended to make the shirt following the pattern as closely as I could … and then I started cutting and messed it up completely on accident! Now, honestly, my first mistake was in procrastinating until last night to start because I’ve been swamped with other obligations this week. After printing and taping and cutting out my pattern, I laid out my fabric and folded it over, cut the front, and placed the back pattern piece against the fold. I quickly cut around the neckline, across the shoulder, and down the arm opening. As I put my rotary back down to cut the side seam and hem, I realized that when I’d prepared my pattern I’d accidentally cut out only the front neckline …. and that meant I had just cut a shirt “back” with the lower curved back hem and with the deeper scooped front neckline. To make matters worse, I also did not have enough fabric left to cut out a new back! Doh! 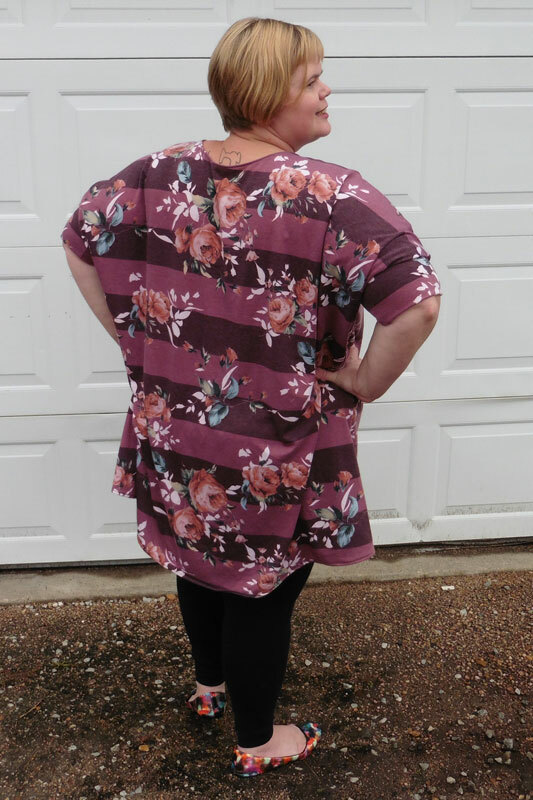 After berating myself under my breath for screwing it up, I decided to just embrace it and make my shirt with a lower, more open back neckline. Life’s not perfect, so why worry about these small flaws, right? It wasn’t the end of the world, of course, just an unplanned departure from the pattern (when I wanted to make it just as written). 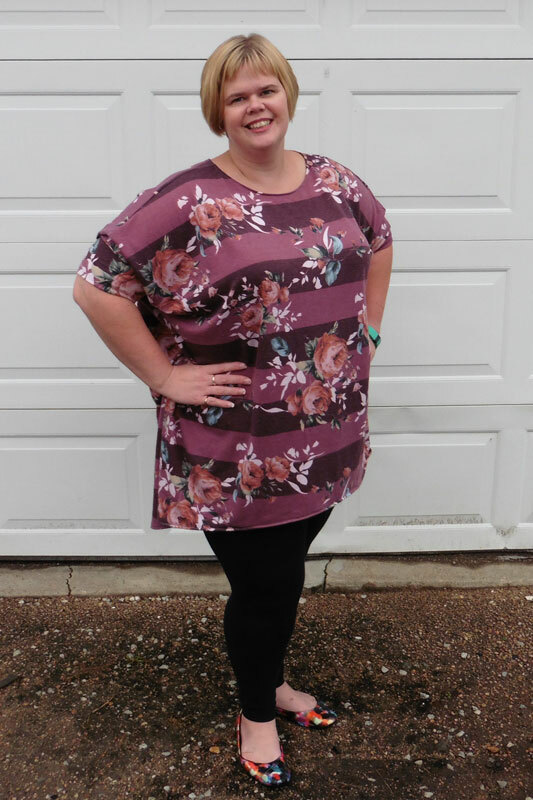 In the end, I love my new Piko Top … open back neckline and all!